I hiked the Poamoho Trail to look for native snails on side ridges and hanging valleys high in the Ko’olau Mountains deep in the interior of the island of O’ahu. 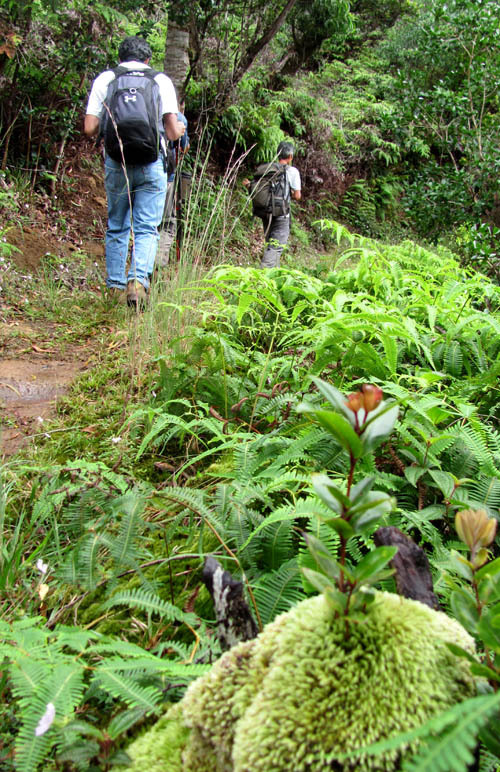 The Poamoho Trail is located on the north ridge of Poamoho Gulch between Wahiawa and Haleiwa and leads to the Ko’olau Summit Ridge at the head of Punalu’u Valley. The trail lies behind private land and a permit is required from the Division of Forestry and Wildlife to get the combination to unlock the gates along the 6-mile 4WD road. The trail is a short 3.5-mile hike to the the Ko’olau Summit and passes through some of the most pristine native areas on the island. Many thanks to Ken Suzuki — who got the permit and drove us up the 4WD road — we pushed-off from the trail head on the contour trail built by the Civilian Conservation Corp in the 1930’s as a Depression Era project. As we hiked in and out of many gullies covered with uluhe ferns we saw a number of ohia seedlings growing from mounds of moss. Poamoho Stream meanders several hundred feet below the contour trail. 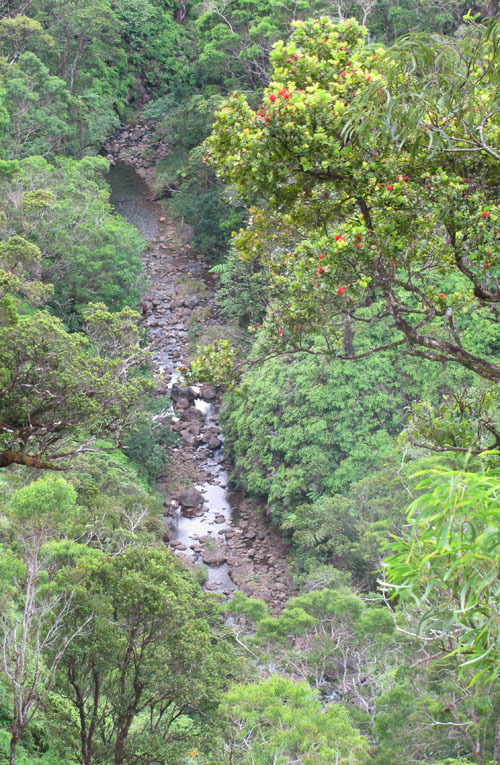 Native plants and animals — uluhe ferns (Dicranopteris linearis), ohia trees (Metrosideros polymorpha), and koa trees (Acacia koa) — thrive along this wild stream in the interior of the island. 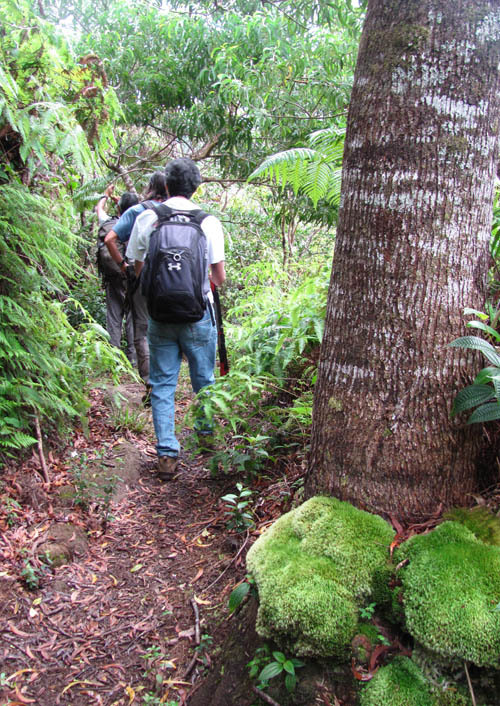 The trail is beautifully maintained by Na Ala Hele. One of my favorite things to see are hapu’u ferns (Ciboium chamissoi) growing in patches of moss under ohia trees. Many different varieties of ohia lehua (Metrosideros polymorpha) can be found right along side the trail. 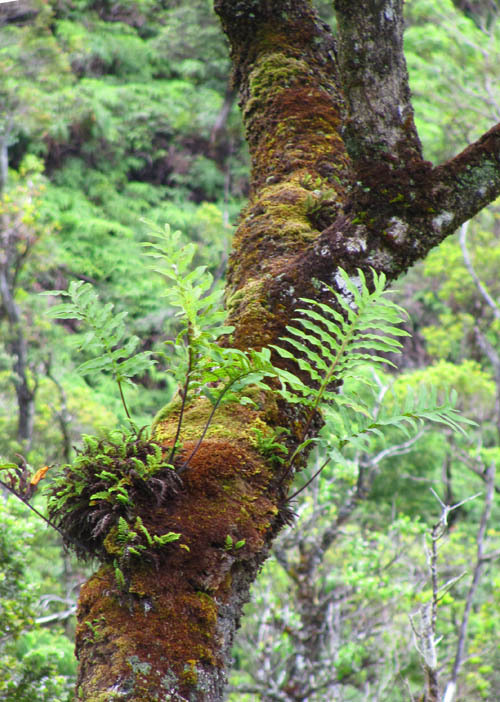 Koa trees (Acacia koa), with their characteristic sickle-shaped leaves, thrive in the Ko’olau Mountains, many of whose roots are covered with lumps of moss. 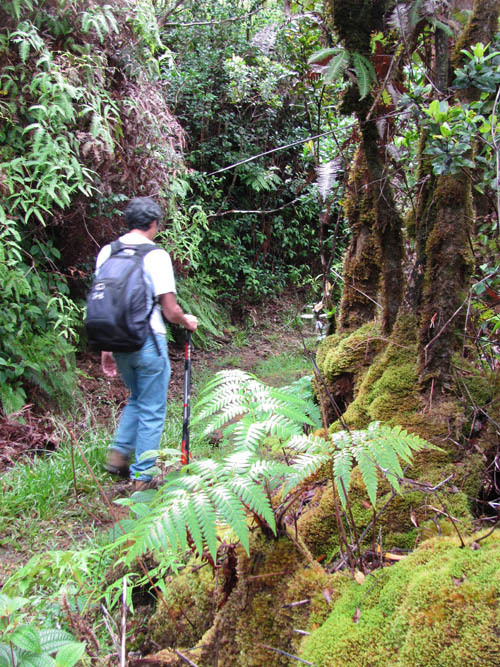 Poamoho receives considerable rainfall and many mosses and ferns grow as epiphyptes on ohia, koa, and other native trees that grow along side the trail. 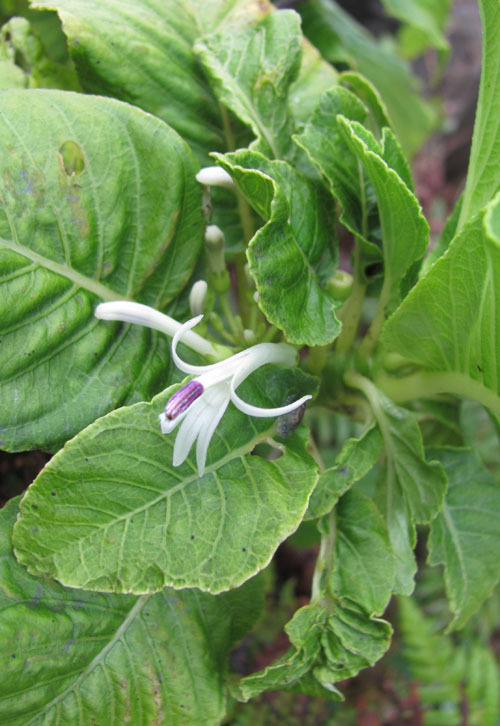 We saw quite a number of kapana — the native mint (Phyllostegia grandiflora) — in bloom with striking white flowers. These small white flowers are about an inch long and have a shape that reminds me of angels. We were thrilled to find an extremely rare Haha (Cyanea accuminata) in bloom with delicate white and purple flowers almost two inches long. Listed as an endangered species under the Federal Endangered Species Act, the plant is not common and I was pleased to see it in the wild for the first time. When we stumbled upon shrubs of akia (Wikstroemia uva-ursi) with bright orange berries three-eighths of an inch long, the fruits looked so tempting that I could not resist trying them. Unfortunately, the berries were exceedingly bitter and unpleasant to taste — I will not make the mistake of trying them again. 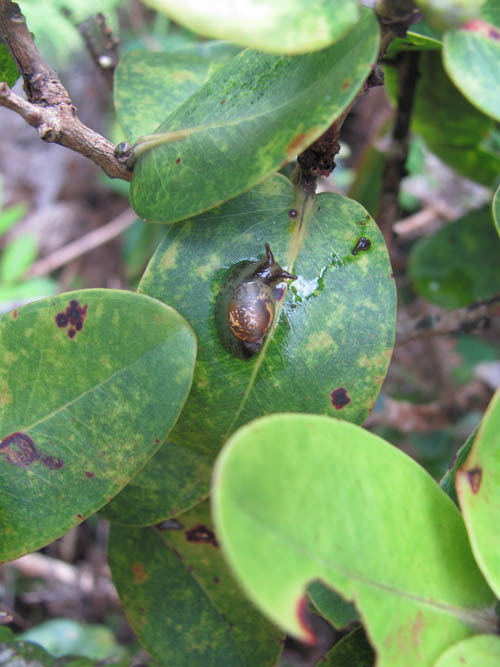 While searching through the foliage we found quite a number of pupu kuahiwi — the generic name for snails — no more than half-an-inch long. These succineid snails (Succinea catinella rotundata) — which are also know by the much more memorable name “snot in a hat” — are the most wide-spread of native tree snails on O’ahu today. 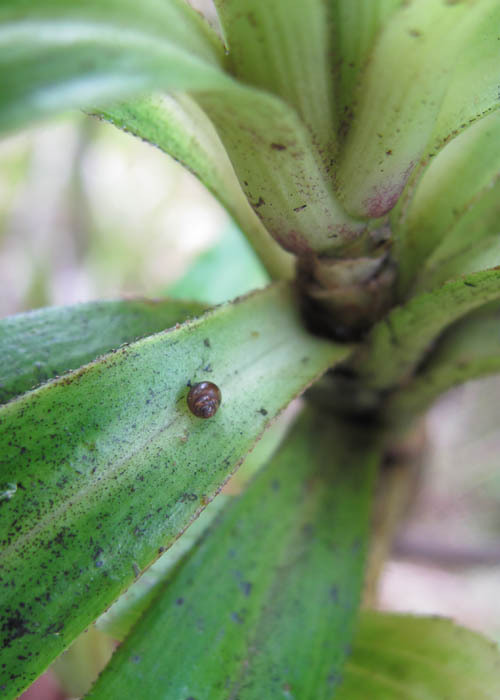 Hidden within the foliage were tiny Tornatellinid snails which grow no bigger than 2 millimeters long. Literally millions of these tiny pupu kuahiwi used to inhabit the forests, but only a fraction of them remain today. Another rare pupu kuahiwi we saw was Auricullela turetella, which is related to the tree snails found on the Kalawahine trail in Tantalus. Several of the trees near the summit had quite a number of these snails on them. 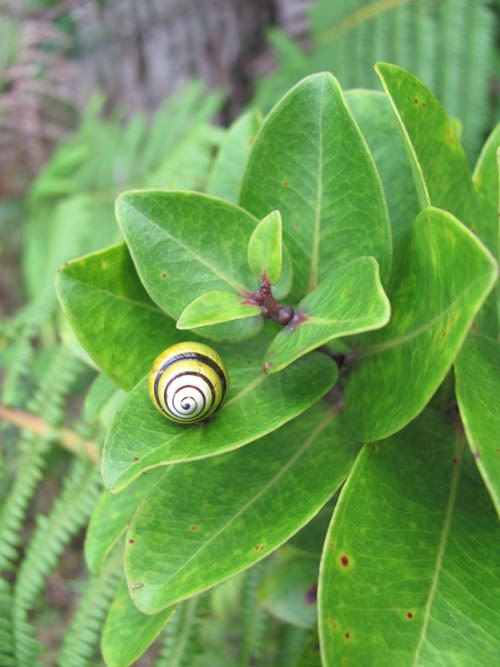 The most striking snail at Poamoho are kahuli or pupu kani’oe — Oahu Tree Snails (Achatinella spp.) 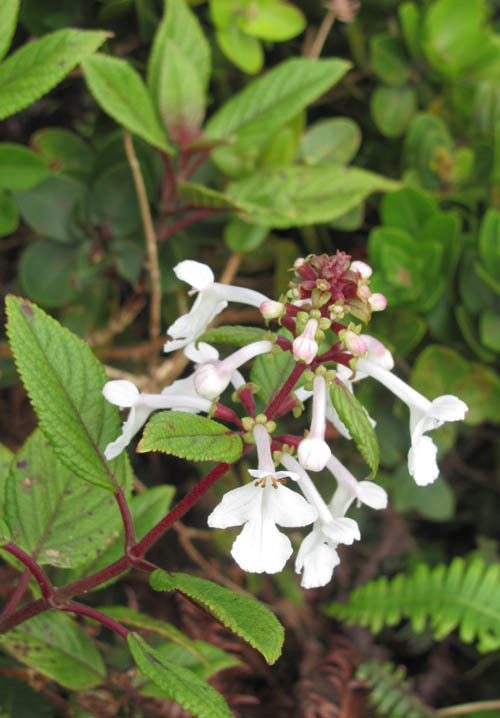 — which are endemic only to the island of O’ahu. The snail we saw — Acatinella sowerbyana — had a beautiful glossy shell about three-quarters of an inch long that was green, yellow, and white, with a black stripe that spiraled to the spire of the shell. These rare tree snails are mostly nocturnal and spend the day asleep on the vegetation. Kahuli feature prominently in the stories and chants of ancient Hawaii. The name pupu kani’oe means “the shell that sounds long” — a reference to their ability to sing in Hawaiian tradition. O‘ahu tree snails were once so abundant that it is said it would rain trees snails if you shook a tree. Each ridge and valley had its own species/subspecies/subvariety with colors and markings unique to that ridge and valley. So beautiful were the shells that a collecting craze swept through the islands in the late 1800’s and early 1900’s that nearly wiped them out. Of the 41 species of Oahu Tree Snails — Achatinella — only 11 remain today — the others have gone extinct. 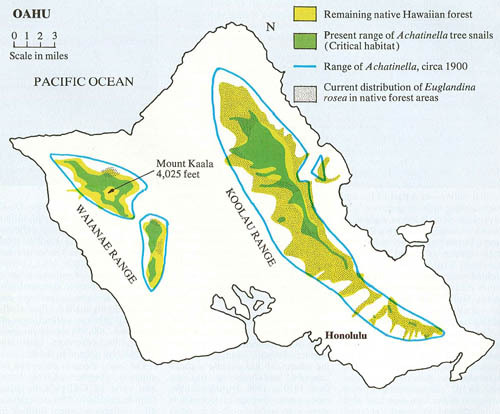 Map showing the range of O’ahu Tree Snails in the 1970’s drawn by Alan Hart. Today, in 2010, their range has reduced even further — only isolated pockets remain. One of the great things about the internet is the people I meet through my blog. I was contacted by Alan D. Hart, a scientific illustrator and naturalist who was a member of the Hawaiian Trail and Mountain Club in the 1970’s. 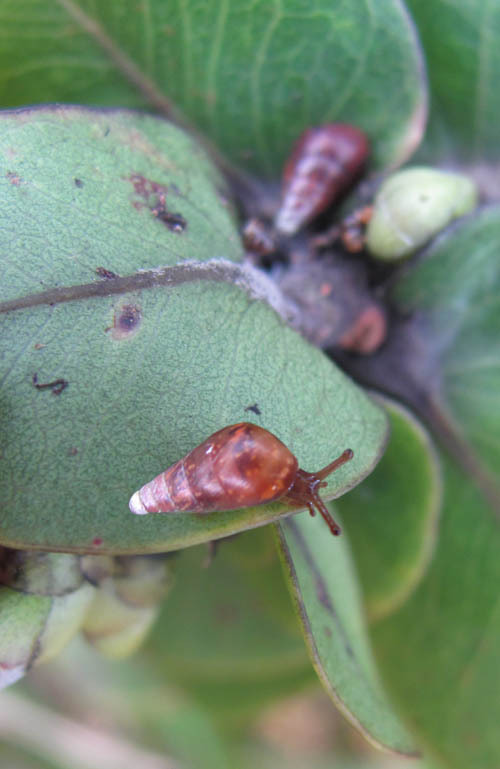 Alan’s enduring contribution to tree snail conservation was a survey he conducted on Achatinella snail populations in the 1970’s where he scoured the mountains of Oahu looking for the last remaining populations. With the data in his report, Alan petitioned the U.S. 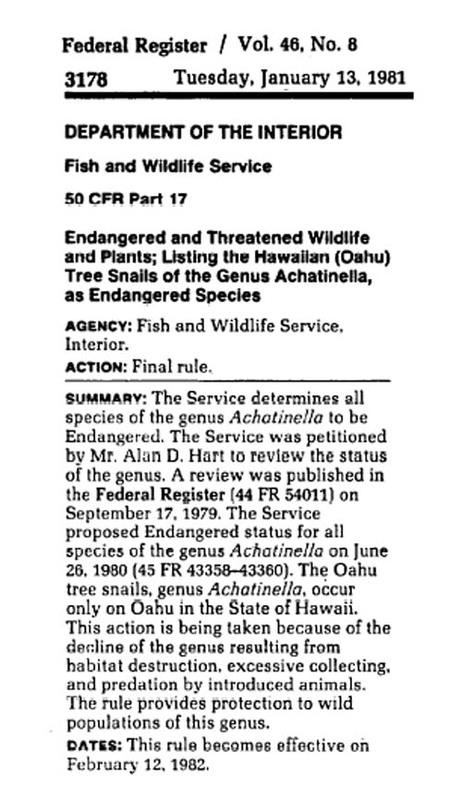 Fish and Wildlife Service to place the entire of genus of Achatinella snails on the federal list of endangered species — which was finally achieved in 1981. 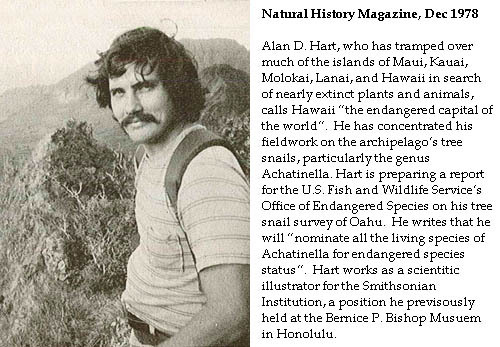 Alan also devoted considerable effort raising the public’s consciousness of the plight of the Oahu Tree Snail. After exchanging email and learning of each other efforts to refind the last remaining tree snail populations, I received a treasure trove of material in the mail — articles authored by him in several publications — “Natural History”, “Defenders of the Wild”, and “National Parks & Conservation Magazine”. Photo of Achatinella sowerbyana by William P. Mull, Courtesy of Alan Hart. This is the same species photographed above — there is considerable variation in the color and markings of Achatinella snails. 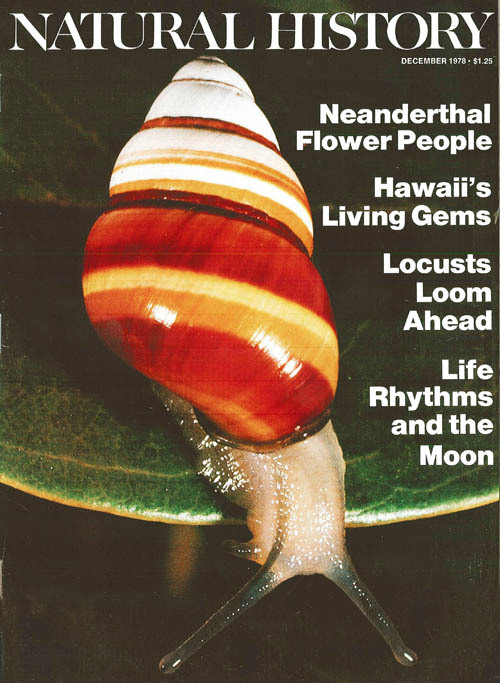 One of the most striking photos I received was on the cover of “Natural History” magazine — a Achatinella sowerbyana snail photographed by William P. Mull. William Mull was the first to use macro photography in Hawaii and captured stunning images of native insects, spiders, and snails. William Mull was a collaborator of Alan Hart and the two worked side by side on a number of projects. 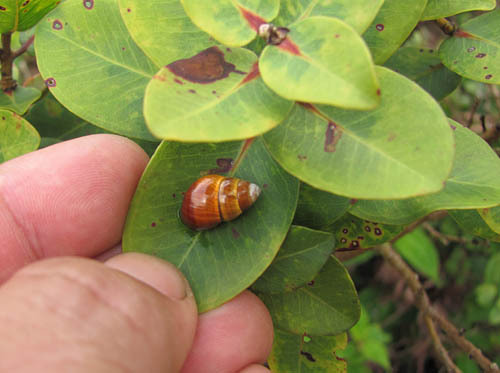 Another native Achintella snail we found was Achatinella lila sleeping on the leaves of ohia. The snail is extremely rare — this was the first time I had seen this particular snail species. It had an glossy shell that was primarily brown in color with yellow undertones. 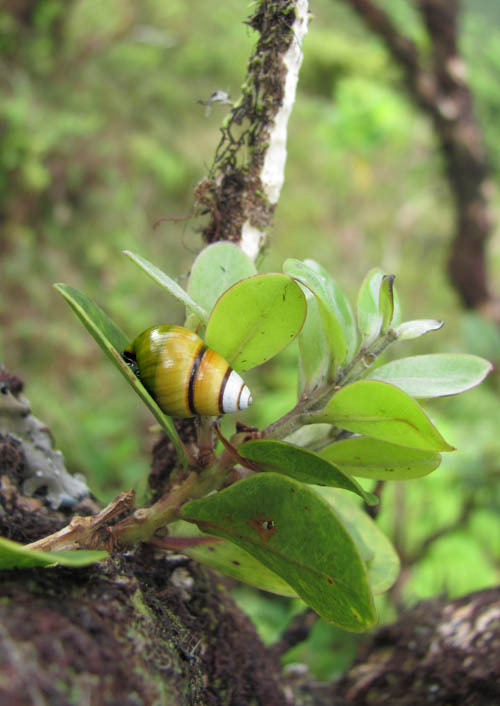 Here is a photo of Achatinella lila — the same species of tree snail in the photo above — taken by William Mull and published in the “Natural History” article written by Alan Hart. 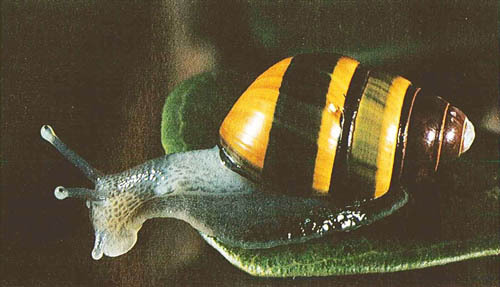 There is also considerable variation in the color and markings of Achatinella lila snails. We were thrilled when we reached the summit of Poamoho — which overlooks the very back of Punaluu Valley — because the skies were unusually clear and gave us a panoramic view of several ridges and peaks overlooking the windward coast — Pu’u Piei, Manamana, Kanehoalani and Ohulehule. 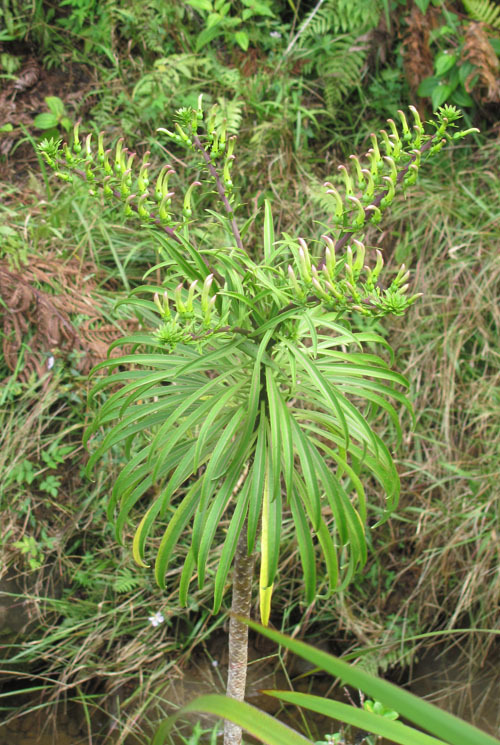 Several koli’i (Trematolobelia macrostachys) were poised to bloom at the summit with magnificent pink-maroon flowers. 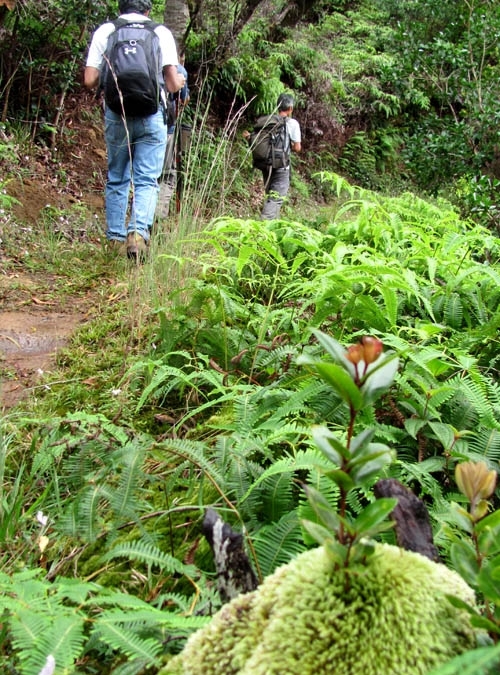 Now is the time to hike up the northern Ko’olau to see the koli’i in bloom. Time passed quickly as we admired the views and explored the area near the Koolau Summit and soon it was time to return the way we had come. 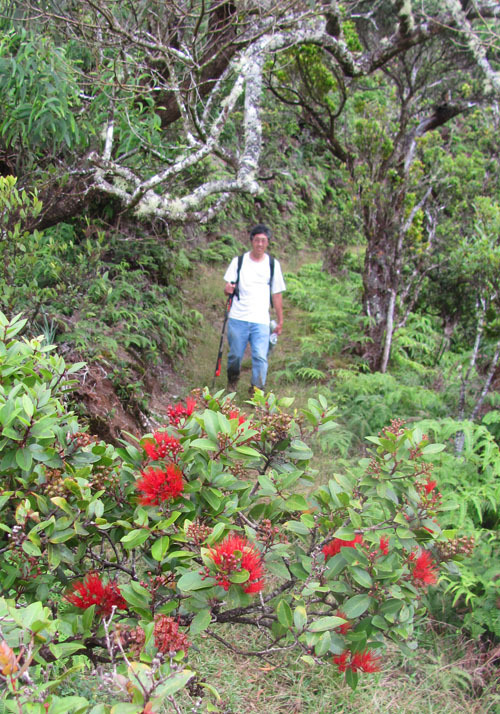 As we descended the Poamoho Trail, I was pleased to see red lehua flowers in bloom beneath a grove of koa trees. 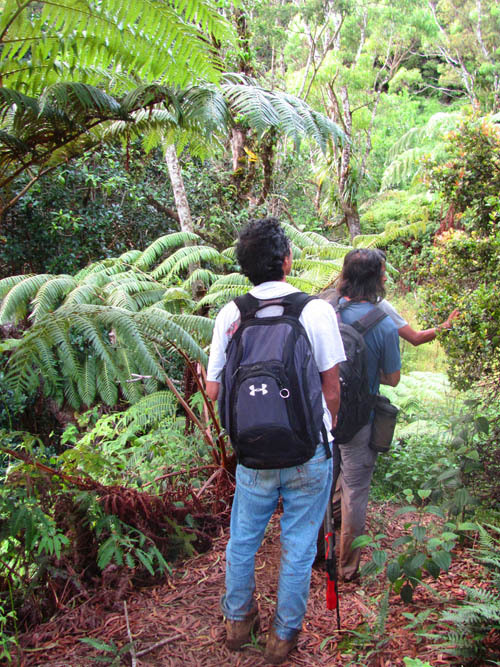 While making our way back to the trail head, I reflected the host of rare and endangered snails and plants we saw at Poamoho. Although I was pleased to have seen them, I was disheartened at the same time — the plight of the Oahu Tree Snail has not improved since Alan Hart got them listed as an endangered species and their numbers continue to decline. Additional conservation measures are needed to ensure their survival into the future. 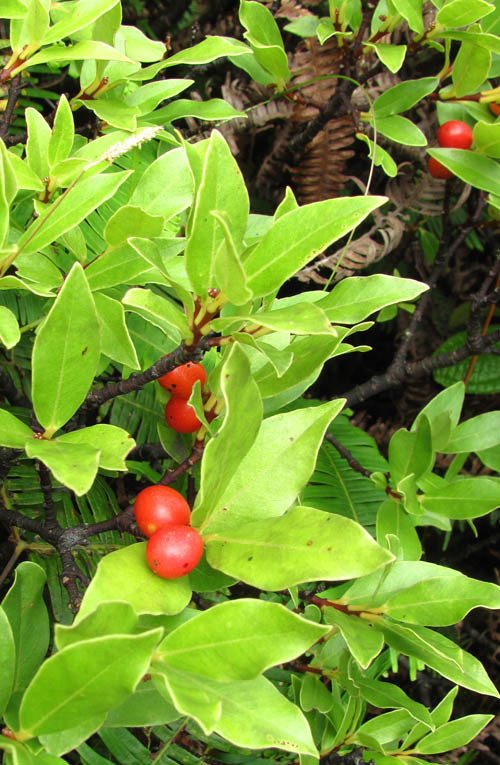 Be careful eating the ‘akia berries. John Hall’s book suggest they may be poisonous and recommends not eating them. The ‘akia was used to stun fish by the Hawaiians according to his book as well. Thanks for sharing all your hard research on the native tree snails of O’ahu. The Hawaiians pounded akia roots into a pulp and spread them on the reefs to stupefy fish — so the fish would be dazed and could be picked up easily. I was trying to see what effect it might have. But it was too bitter — all I could manage was a little taste.